My visit to the historic country town of El Tuito had given me a taste of the real Mexico during my excursion from Puerto Vallarta. And my authentically Mexican explorations would continue as local guide Jesse Morales kept driving on the curvy roads through the countryside. Finally, about 20 minutes or so northwest of El Tuito, we had reached our second destination of the day: the Hacienda el Divisadero, a country estate owned by Don Tino and his family. Don Tino is a very successful local entrepreneur who also owns Mariscos Tino’s, a seafood restaurant just steps from Puerto Vallarta’s famous Malecon; Mariscos Tino’s in Punta de Mita and Laguna Tino’s, which features lagoonside dining in Nuevo Vallarta. As we entered the historic estate, Jesse showed me one of several “villas”, colonial-style bedrooms with high ceilings, stone walls and hand-carved wooden beds. Steps down a tiled corridor that was lined with many typical round leather-covered chairs we reached the restaurant and bar area. 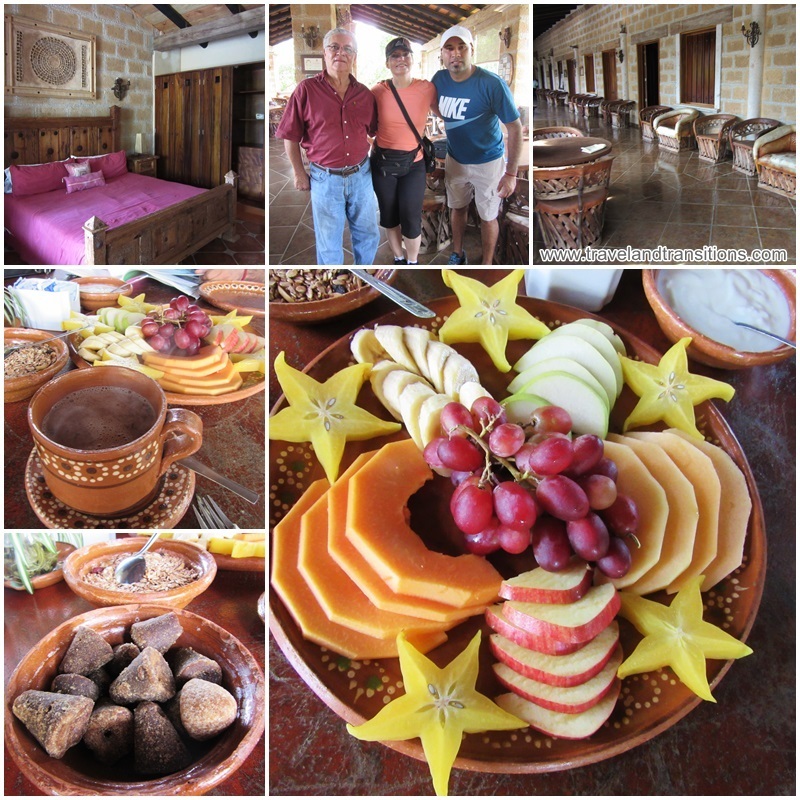 We were warmly welcomed by Don Tino himself and his brother Manuel, who had set up a beautiful breakfast table for us with dishes that would typically be eaten as a morning meal in Mexico. The “taberna” is a cozy open air eating area with great views over the surrounding farm land. The gorgeously laid out fruit platter included apples, melon, bananas, grapes and star fruit, with a side order of granola and yoghurt. I had also ordered authentic Mexican hot chocolate, which was delicious. Manuel brought me an order of “atole”, a rather bland-tasting hot corn beverage that is sweetened by biting off small bits from cone-shaped dark sugar pieces. Now appropriately strengthened, Jesse gave us an entertaining and informative demonstration about how Mexican cheese is made. He showed us a bowl of raw, unpasteurized milk to which rennet, a complex of enzymes that comes from the stomachs of deers, is added. This creates a chemical reaction that makes the milk curdle which later becomes solid cheese. The watery portion that is left over is turned into the stringy quesadilla cheese. In his humorous yet educational way Jesse explained to us how various other types of Mexican cheeses are made. 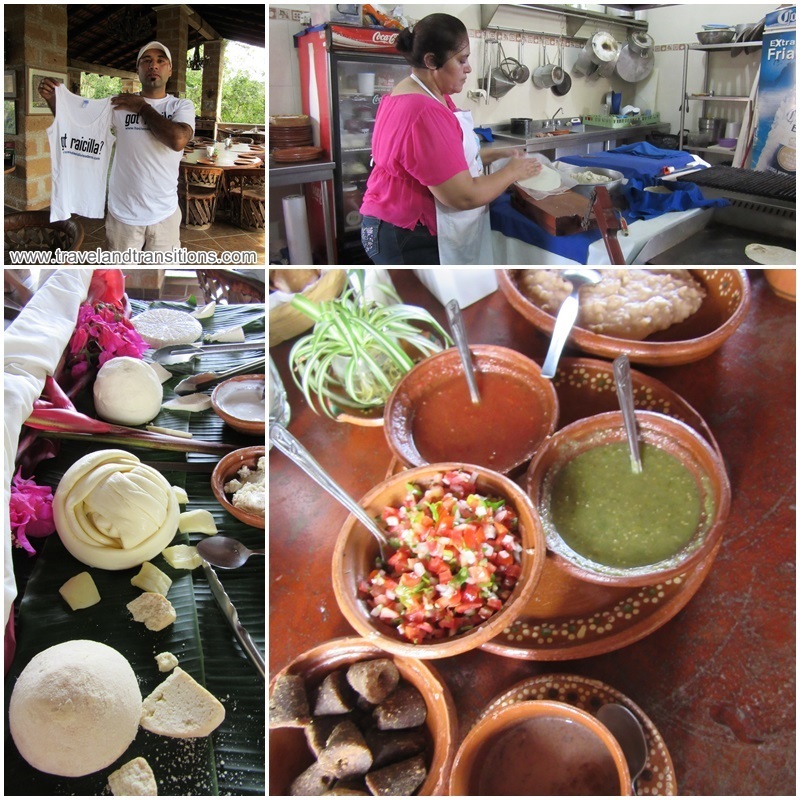 We learned about the dry salty “queso ranchero”; “queso fresco” (literally: fresh cheese), the crumbly “queso cotija” – Mexican Parmesan cheese that has been rested for a month; “panela” cheese – the Mexican mozzarella; “requezón” – which is reminiscent of Ricotta cheese; and “queso Oaxaca” which is also called “quesillo” (little cheese). Jesse also demonstrated how “crema” or “jocoque” is made, which is quite reminiscent of thick yogurt. Finally, Jesse explained, sour cream happens when you add lime to the jocoque. Then Jesse took me into the kitchen where I was witnessing how tortillas were made by hand. This was definitely a demonstration of food preparation in the real Mexico style. A minute later it was my turn and with my two left thumbs I clumsily made my own tortilla with a wooden tortilla press. As the crowning touch, I got to eat my own hand-made tortilla (and a few more) with red and green salsa, refried beans and a tasting of the many cheeses that Jesse had demonstrated. 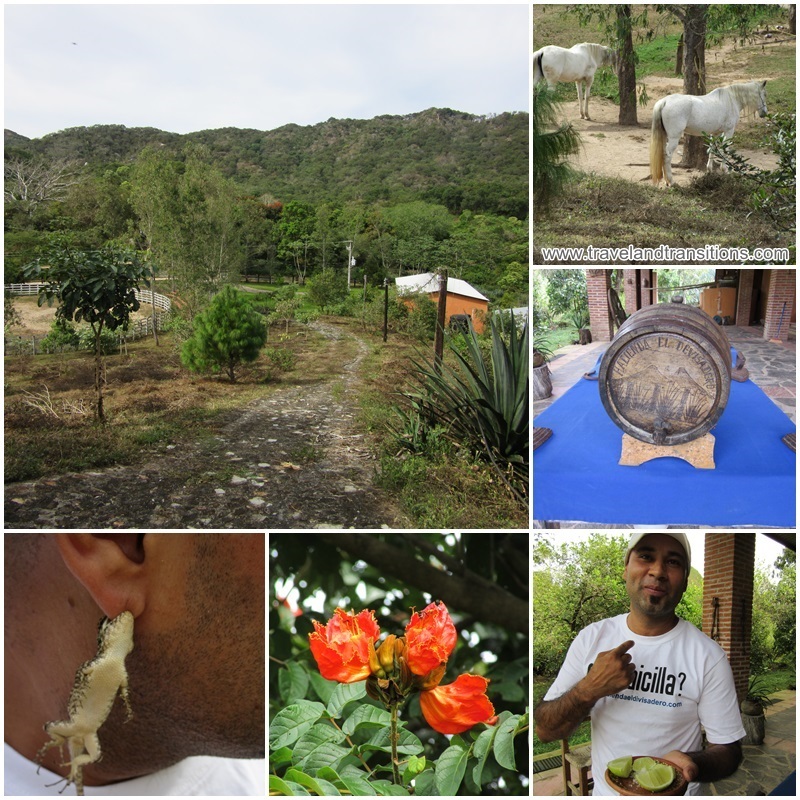 After this entertaining introduction to the culinary traditions of the real Mexico we headed outside and Jesse showed me the garden and the surrounding fields that are part of the Hacienda El Divisadero. In the back garden, he caught a small iguana that kept biting his fingers. With his off-beat sense of humour, he stuck the iguana on his ear lobe, and the small animal promptly clamped on to it with its sharp teeth, giving Jesse an instant iguana earring (and tiny bitemarks). Then we walked over to the Raicilla Distillery that is part of Hacienda El Divisadero. “Raicilla” is a distilled spirit that is made in the Puerto Vallarta area from the green agave plant and dates back to pre-Hispanic times. 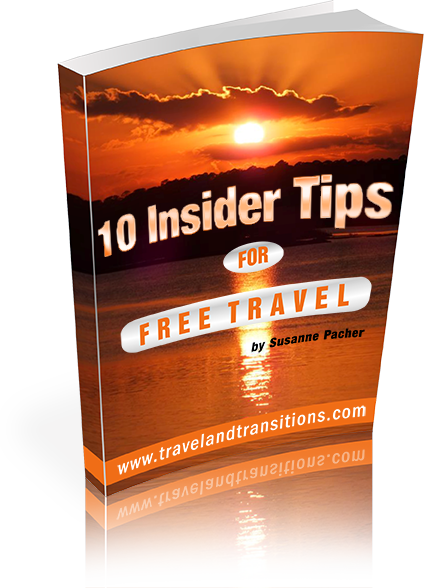 It is distinct from other Mexican spirits that are made from different agave plants such as Tequila and Mezcal. Raicilla is often referred to as the “Mexican moonshine” since only recently companies have been selling legal brands of it, Hacienda El Divisadero being one of them. Jesse also showed me the proper way to drink Raicilla: you exhale, and just when you have no more air in your lungs you drink the whole shooter at once and follow it up by sucking on a piece of lemon or lime that is dipped in rock salt to clean the palate. Next on our agenda was an outing to explore the real Mexico in the farther reaches of the hacienda, a visit to see some ancient petroglyphs and a round of horseback riding.